How can I make the entire menu item toggle its submenu? How can I make the menu always open on desktops? This tab is specific to the main ShiftNav Panel which is created by default when you install ShiftNav. 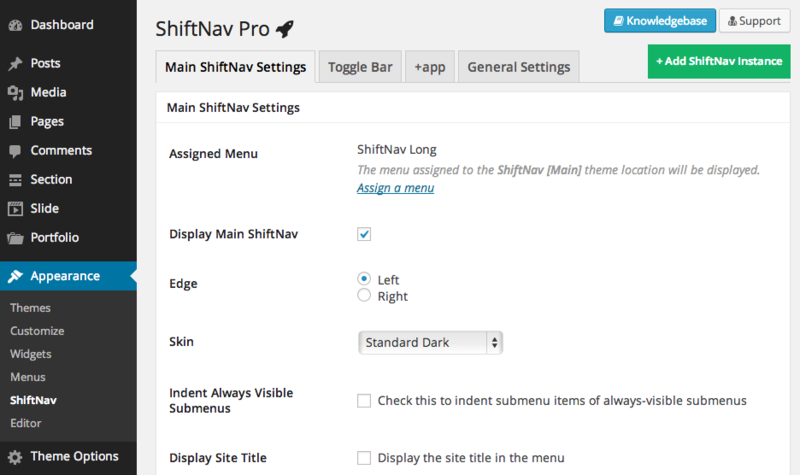 The settings on this tab will control the main ShiftNav instance. This tab controls the main toggle bar, which toggles the Main ShiftNav open and closed. You can configure the settings for the toggle bar here. The tabs for any additional ShiftNav instances you create via ShiftNav Pro will appear with a + in front of the instance ID. These contain settings specific to that instance. This tab contains global settings for ShiftNav. These settings affect all menus and the functionality of ShiftNav overall, as well as miscellaneous configuration options for the plugin. In the upper right, you’ll see links to the ShiftNav Knowledge base and to the Support Forum (for Pro users). The green button in the upper right allows you to add new instances of ShiftNav. See the Instance Manager article for more information.